It’s time to let the sunshine in. 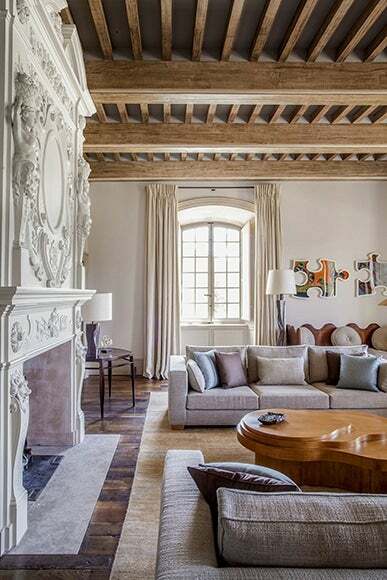 These luminous living rooms are filled with stunning architectural details — glass walls, floor-to-ceiling windows and arched French doors — that make them glow. Fox-Nahem Associates built two full-height windows and a skylight to create this sunny Southampton sitting room. In order to emphasize the property’s lush landscape, the room’s furnishings — including lounge chairs by Kerstin Hörlin-Holmquist — are primarily neutral, save for the hand-woven Fedora Design rug. 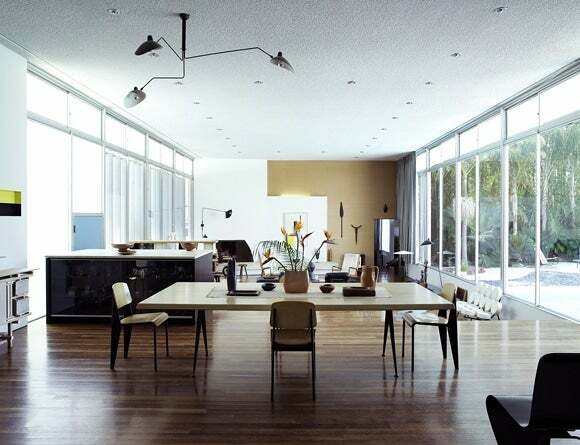 BoydDesign’s high-concept restoration of Oscar Niemeyer’s 1964 Strick House in Santa Monica emphasizes a dialogue between French designers and the Brazilian architect to “create an International Fuctionalist narrative.” The room includes a table and chairs by Jean Prouvé; a painting by John McLaughlin; a Gerrit Rietveld buffet; and a Donald Judd sculpture. 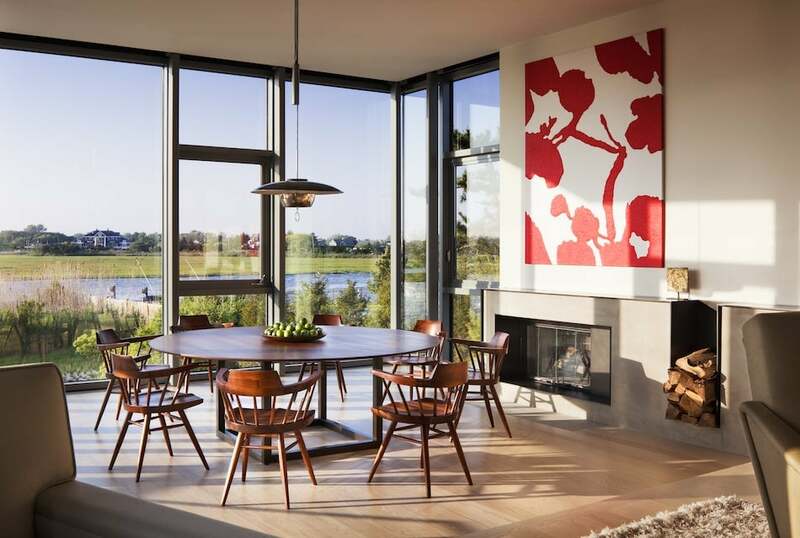 Architect Michael Haverland engineered thin steel window mullions for this East Hampton home to accommodate the client’s request for unobstructed views. The decor seeks to create “an anachronistic style” that references both modern and traditional vernaculars, and includes a 1953 Edward Wormley coffee table; a pair of 1951 Marco Zanuso Lady chairs; two Eames prototype chairs; and a Fornasetti magazine stand. 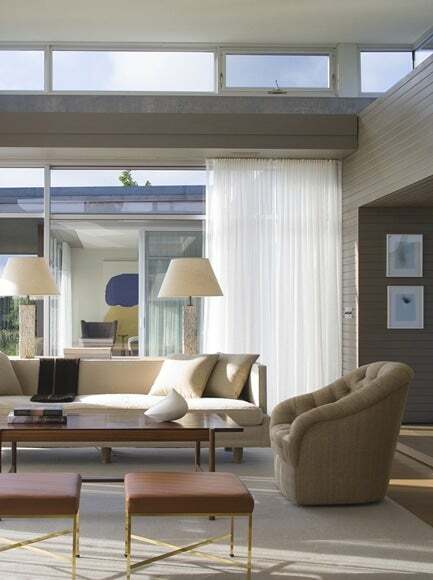 Thad Hayes referenced the architecture of Los Angeles’s 1950s Case Study homes to design this Westport, Massachusetts vacation retreat for his client, a landscape architect. The 1960s club chair is by Ward Bennett, the reupholstered brass stools are by Paul McCobb, the 1950s marble-and-brass lamps (behind the sofa) are by T. H. Robsjohn-Gibbings and the small tabletop vase is vintage Tapio Wirkkala for Rosenthal. 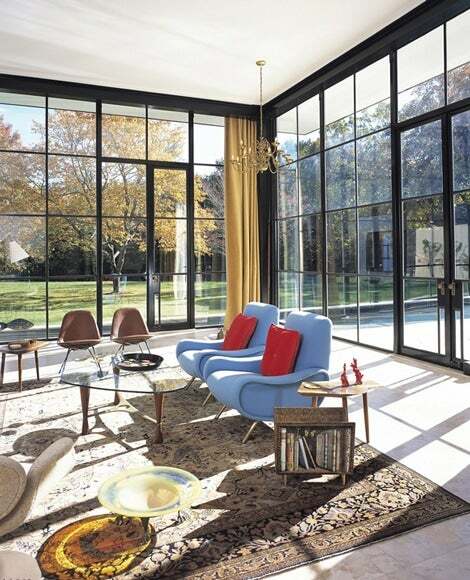 Timothy Whealon used a tonal mix of neutrals to create this sleek, glass-walled Southampton living room. The sofa is by B&B Italia, and the lounge chairs are vintage PK22 models by Poul Kjærholm. 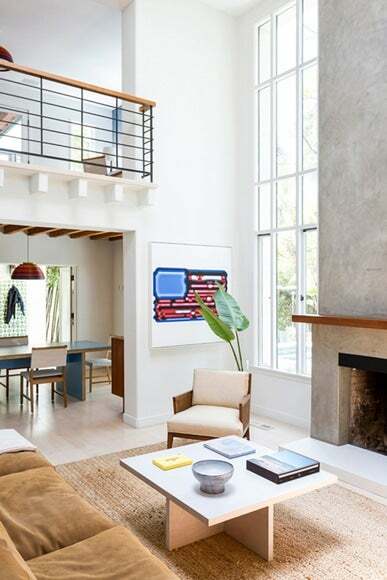 Ashe + Leandro designed this Venice beach house to be open, modern and flecked with color. The dining and coffee tables are by Doug McCollough and the rainbow pendant light is a vintage Austrian fixture. In Nashville, G.P. Schafer Architects was tasked with creating a fresh, modern reimagining of Boxwood, a 1915 Georgian estate designed by Charles Platt. Here in the loggia, the firm restored the room’s original French doors and installed a bold, graphic limestone floor with diagonal oak banding. In Marin County, California, Suzanne Rheinstein designed this sitting room for a garden enthusiast client. Inspired by both the work of Sister Parrish and the British Regency period, the space includes an antique French Directoire stool and porcelain flowers by artist Vladimir Kanovsky (from 1stdibs dealer Hollyhock). 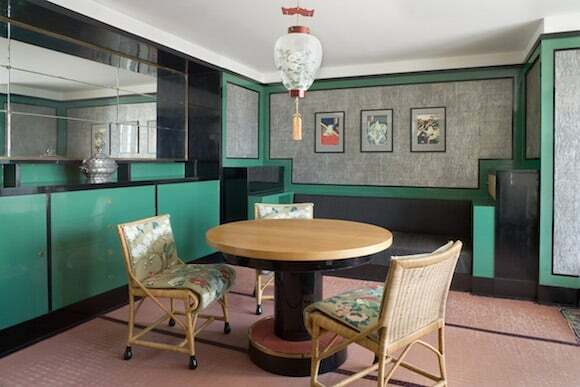 The hand-painted walls depict a bamboo treillage in the chinoiserie style. 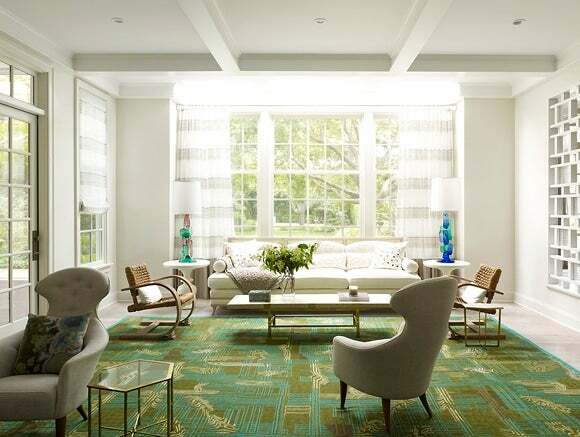 In another Hamptons project by Haverland, a pair of armchairs by Nanna Ditzel sit alongside a 1950s Serpentine sofa is by Vladimir Kagan. The Jacks side tables are by Adrian Pearsall, and the 1960s Murano glass chandelier is by Venini. 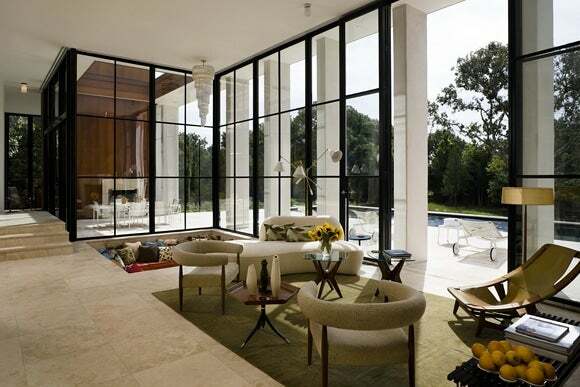 The conversation pit in the rear of the photo was carved out of the home’s travertine marble base. In a late 18th-century townhouse, Francis Sultana designed this living room (including the bespoke sofa and ottoman) around the large-scale artwork Reflection Memory Door by Zhang Huan. 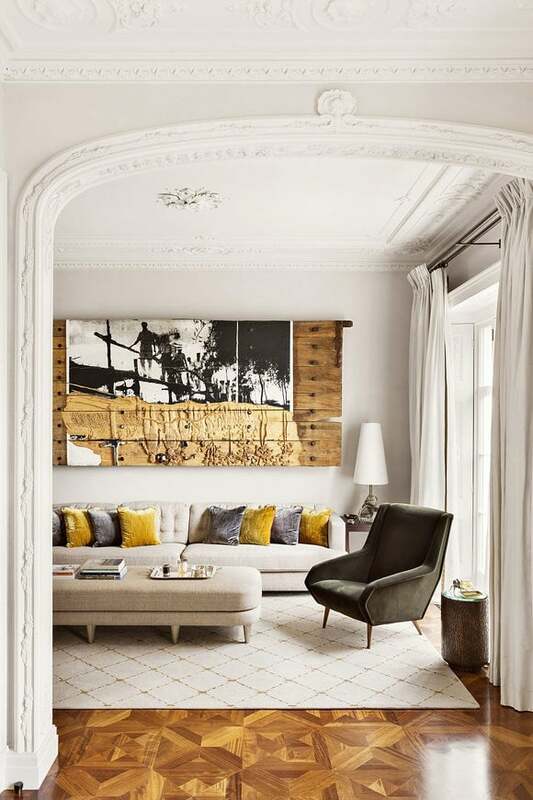 Pale gray plaster walls and neutral-hued upholstery offset the warm tones of the parquet floors and yellow silk pillows, and tie together the colors of the work. The armchair is by Gio Ponti. Tall, arched French doors provide three exposures in this Main Line Philadelphia estate decorated by Brockschmidt & Coleman. In order to maintain circulation through the doors, the firm grouped furnishings — including a black lacquer Chinese table and a pair of Chinese Chippendale chairs — in the center of the space. 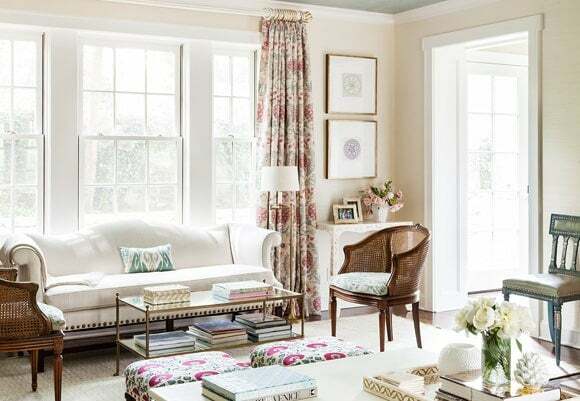 Kelly Behun cites “Tangier meets Rio” as the look for this Hamptons beach house, which is outfitted with textiles she brought back from Morocco and a mosaic-covered table of her own design. The rope-wrapped chair and side table are by Christian Astuguevieille from Holly Hunt. Atop the table, the carved wood clock is by Mexican artist Pedro Friedeberg and the ceramic vase by Japanese artist Shizue Imai. 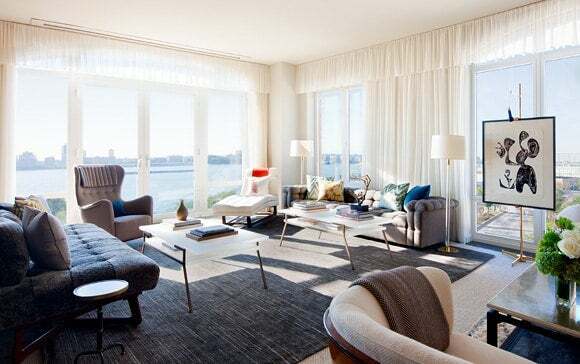 Shawn Henderson used a Swedish wing chair and a Dunbar daybed — both from 1stdibs dealer Wyeth — in this New York City living room with wraparound river views. 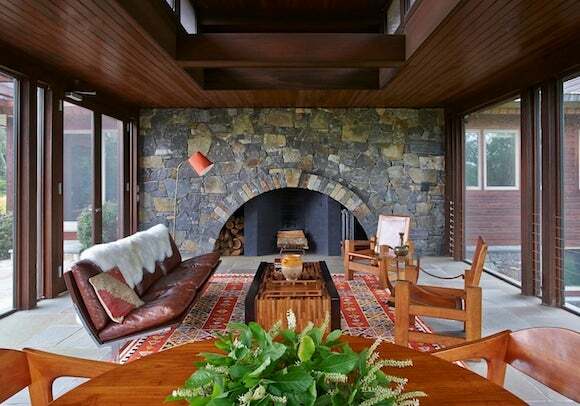 The designer used layered rugs to define seating areas within the expansive space. 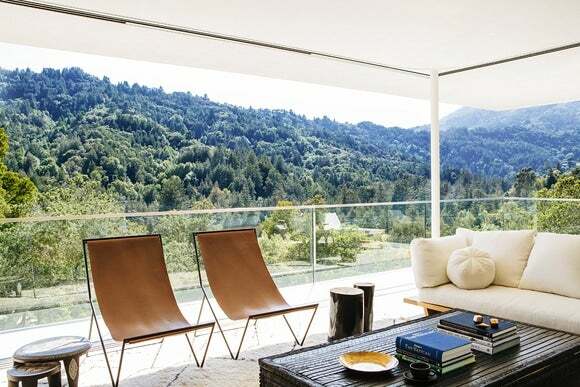 Nestled into an undeveloped swath of Northern California forest, this Marin County home decorated by NICOLEHOLLIS offers unobstructed views of the surrounding foliage. The designer used elemental textures like white oak, linen and leather to create a dialogue with the outdoors. The sofa is a custom piece by the designer, and the tabletop objets are from The Future Perfect. Sara Gilbane used a melange of jewel-toned prints to create a youthful, vibrant living room within a 1919 Tudor home in Westchester, New York.